1. Include the award logo(s) in a post or in my blog. 2. Answer 10 question about myself. 3. Nominate 10 to 12 other fabulous bloggers. 5. Share the love and link the person who nominated me.
. What is your favorite animal? All–even the Aardvark!
. What’s your passion? Learning. Reading. Writing. Photography. This entry was posted in Uncategorized and tagged authenticity, behavior, chasing, chasing perfect moments, childhood, cultural mindsets, freedom, going home, healing, ideaologies, illusions, journey, listening, reality, reconnecting with child, safety, sunshine blogging award, the perfect moment, writing resources. Bookmark the permalink. 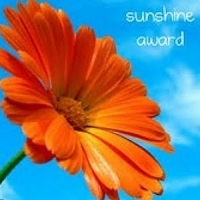 11 Responses to Sunshine Blogging Award! Congrats! Your writing surely deserves this award. I love your Aesop quote. 🙂 Last week, while walking by a store I saw some of their wooden signs had fallen down and hung them back up. A man walked by and said, “That was nice, I am going to have to pass that on.” No wasted moments.